So as the last of the turkey sandwiches have finally been eaten, and the New Year welcomed in with way too many bottles of Prosecco, believe it or not we have arrived in 2017! Wow, how did that happen? So as 2017 begins, I feel now more than ever, it would be a good time for me to get clear on my goals and intentions for the year ahead as for the first time in a long time I have so much I want to achieve. So what are my goals and how am I going to reach them? Over the past few years due to my debilitating illness, I have no had time for dreams. My goal every day was to simply survive in less pain than the day before. But even though the last few years have been eventful (to say the least! ), this rollercoaster ride has blessed me with a new direction in life. One with a passion, a purpose and another reason to keep fighting. This time though for someone else. Flying had meant everything to me and I truly believed that nothing would ever fulfil me like the excitement and adventure that life as cabin crew did for one of the best airlines in the world. But I am happy to say that I was totally wrong. Upon my journey of recovery, I discovered new passions and talents inside of me that I never knew even existed, for writing, for nutrition, for holistic therapies, for meditation, yoga and the list goes on. Effectively this experience has ignited a passion inside that I can only describe as a burning desire that I want to share with the world. To inspire, to provide hope, to encourage change, to open people’s eyes to other ways in which the body can heal. I have never felt driven like this before and in a funny sort of way, maybe this was my purpose in life all along. As much as I thought endless days of partying in Las Vegas would never get old, perhaps this was actually my calling? They do say everything in life happens for a reason after all. Say hello to Hope Health Coaching! My goal is to create a six month programme for my clients whereby I work with an individual to help them achieve their personal health and wellness goals. I particularly want to work with the migraine/headache community changing lives of the people out there suffering. I want to offer this programme worldwide so I am planning to conduct these coaching sessions either in person but mostly through Skype sessions as an online business. From March I am able to start practicing as a trainee Health Coach and I will be taught the in’s and out’s of how to run a business, branding and marketing. I can’t wait! Hope Vs Headaches started as simply a way for me to express myself during the hard times. Through my posts I have discovered a passion for writing but I have learnt that by sharing my story I have been able to help other individuals in similar situations. I want to continue writing my blog and to be able to share my work with a larger audience. I want to learn more about food photography so my brand Hope Vs Headaches is clean and professional and continue to expand on the work I am doing. If you haven’t checked out my Instagram then find me at @HopeVsHeadaches where I post anti- migraine food options such as juices, breakfast ideas and all the ways in which you can enjoy a delicious plant based diet. So since starting this blog I have discovered a passion for writing. Who knew it would be something I enjoy so much. As a result I have started to write a book. I know, me! Write a book! I never would have believed it years ago. Anyway, when my course finishes in September I am going to enrol on another course that IIN offers which is a six month course to guide you through the steps of writing your own book, all the way through from start to finish including how to get it published. My book is a self help guide to healing yourself holistically from migraines and headaches through diet and lifestyle changes alone. I will teach readers all about inflammatory foods and how to remove them from their diet and replace them with a nutrient abundant plant based diet that will improve their health and headaches. This is an exciting step for me and until September I will continue to plan and gather information that I want to include in my book. Now to my personal goals. Since my migraines began I was put on two types of medication. One a beta blocker to prevent migraines and the other a kind of antidepressant which is also used to treat migraines. As I now stand in the best health I have been since I started this journey, it’s time to break free from these medications. The doctor advised me that we are going to need to do this very, very slowly as I could get some nasty side effects otherwise. Guess what they are… headaches! Ha, hilarious! I now wish that I had never started taking them but at the time I knew of no other options so of course I got into the pill taking cycle that society teaches us to do. The huge motivation for me to do this is that if me and my husband want to start a family in the future, I would need to be off all these medications. For so long I thought we would never be able to have kids due to this illness and I never actually realised how important it was to me until the prospect of it was taken away from me. So this is a big change for me I need to make. Finally this one is all about me and my self confidence. Due to everything I have been through, the change in diet and the fact I haven’t been able to exercise for nearly four years, I have unfortunately put on some weight. I have to admit it can make me feel very low at times. I am currently working with a Physiotherapist to strengthen the muscles in my neck, shoulders and core so I can get back to some sort of exercise. I have been advised this will be a slow process and that I need to be patient. So my goal is over the course of the year is to keep up my Physio exercises which will enable me to get back to exercise, and in turn I will be able to lose the weight and feel better about myself. So here are my intensions for the year ahead. I find by putting pen to paper and writing them down I become more accountable for them. Give it a try yourself. What are your intentions for 2017? 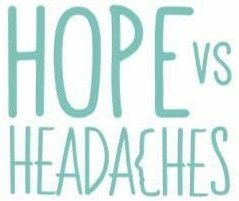 Wishing you a happy and healthy year ahead from Hope Vs Headaches! Next Entry What Is A Health Coach?